The Chandris Story as Told by Demitrios Kaparis. 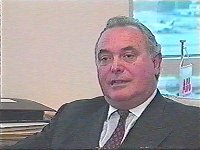 Mr. Kararis was the technical director for all of the Chandris company and a member of that firm since 1960. For many years he has been responsible for their purchases including the "America". The Australis to the Italis. Mr. Chandris sent me to New York, in August 1964, to inspect her. "I remember standing very early one morning on the end of pier 86 as the America was being berthed. I recall seeing the United States, the Leonardo Da Vinci, the France and the Bremen that same day-what a collection! Once aboard the America, I toured her for eight hours along with the staff captain. I was enormously impressed, but we had to be very, very discreet because of union troubles. I had no doubts: this was the ship that would make Chandris famous. She was unbelievable! Anthony Chandris accepted the recommendation and authorised the purchase of America's second largest liner. "this was a great leap for the company" noted Kaparis. We took delivery of her on the 16th of November, 1964 at Newport News shipyards in Virginia, and then went full speed to Piraeus, Greece. Mr. Chandris had promised to "bring home work" and so the entire conversion was done at Ambelaka shipyard in Greece. I lived onboard from that November until the following August, and throughout occupied a suite that we made over as a technical office. We had two secretaries, and full telephone and telex connections. The ship remained at anchorage in the harbour almost throughout and was "fed" by a series of barges and floating warehouses. We spent over $2 million on the project, then the largest of it's kind ever done by a Greece. We even wanted to change the exterior of the ship with one, new, very large funnel, but this never materialised. Mr. Kaparis immediately drafted a sixteen-page report to Mr. Chandris in London, "I estimated that we could convert the ship to carry as many as 2,400 passengers or more that double her existing capacity. We could use her on 75-day around-the-world sailings with her speed of 22 knots (comparatively, she then burned 256 tons of fuel per day as against the present day likes of 132-134 for the Meridian, 86-87 for the Horizon and Zenith"). Formally Christened Australis, she was finally outfitted with a maximum of 2,258 passengers, all of them in tourist class. Her new life which began with a maiden departure from Piraeus, on August 28th, 1965, was as queen of the Greek-Australian migrant trade. Thereafter, she generally sailed outwards from Southampton (and often from Bremerhaven and Rotterdam as well) to Naples, Piraeus, Port Said, Suez, Aden, Colombo, Freemantle, Melbourne, Sydney, Auckland, Wellington, Suva, Balboa, Cristobal, Port Everglades and then back to Southampton. "On our first trip, we also stopped at Beirut and took on 200 Lebanese migrants," added Demitri Kaparis. "but the actual conversion was not complete. Discreetly, our work continued. We added a Ballroom and placed two pools in the old aft cargo holds. Unusually for a Chandris ship, we used a light grey hull at first. We had removed a half-inch of black paint from her United States Lines days during the refit. The initial white bled through at first and so we had to use the grey for the first years. In all, I spent three years on the Australis conversion. While her tonnage increased from 33,961 to 34,449, she was assured the distinction of being the largest liner under Greek colours. Her large capacity gave her an added distinction: she carried more passengers than any other major liner then afloat. The 22-knot Australis, certainly the fastest in the Chandris fleet and one of the best in foul weather, was operated on an accelerated 60-day schedule of circumnavigation. The run from Southampton to Sydney via the Suez, for example, averaged 28 days. Overall, she rarely remained in port overnight. 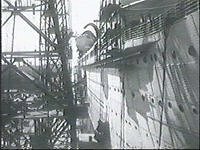 "she barely had a delay until as late as 1975," noted Mr. Kaparis, "she was at Rotterdam Drydock Company yard and was held up an additional three days. we had 2,000 passengers waiting at Southampton and almost all of them had to be placed in hotels". While imigrants were her mainstay on the outward voyages, she also catered to world cruise passengers as well as Australian tourists making family visits to Europe and, in particular, to Britain. She also carried interport passengers such as American travellers going eastbound from Florida to Northern Europe. Most of the immigrant passengers-who included British, Italians and Greeks as well as Germans, Dutch, Austrians, Yugoslavs, Cypriots, Lebanese and Maltese-sailed as part of the Australian Government's massive resettlement scheme, which was awarded entirely to Chandris in 1968. This meant that every sailing was full up, often to the very last berth, and remained a Chandris exclusive until 1977. If the immigrant's application was accepted, these passengers paid as little as £10 for the four-week outward passages. It also meant a guaranteed return passage for dissatisfied settlers who opted to return after a mimimum two-year stay.Some migrants waited as long as ten years before they had assigned berths. Some passengers travelled with trunks filled with nothing more than olive oil, which they feared would be unavailable Down Under, while others had as little as a single set of clothing, other passengers, fearing the open seas, rarely left their staterooms. At its peak, the Chandris agreement with the Australian Government included five large passenger liners with a combined capacity of 50,000 migrants a year to the cities of Freemantle, Melbourne and Sydney. Almost always full to absolute capacity, and this included Northbound voyages as well, the Australis became enormously popular and a very well known ship. "she was our best ship for those years", agreed at least three Captains. Her outward passengers lists also often included as many as 500 children and therefore required a special third sitting in the dining room just for these younger passengers. And sometimes, there were other young guests aboard. "One of our most famous trips aboard the Australis was voyage number 31, in 1971", recalled Captain Tourvas. "We were bound for the UK from Australia and New Zealand with 2,200 passengers-1,600 girls and 600 boys, and all of them between the ages of 18 and 25!". 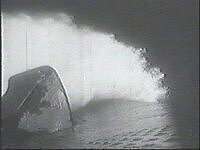 The Australis had her closest call in the South Pacific, every seaman fears it because it's so unpredictable, on 22nd. of October 1970, a fire broke out in the kitchens quarters on the Australis whilst steaming northwards to Panama and then onto Europe. As usual, she was heavily loaded with passengers. "I received a message in Athens that the ship was burning and had to be abandoned! "It was an accident that we had never faced before, but I knew my destination at that moment, commented Mr. Kaparis. "After an half hours meeting about the fire Mr. Chandris said "Demitri, you are the youngest and strongest, so you must fly out immediately and meet the ship in Fiji". She was sailing between Auckland and Fiji at the time, carrying 2,446 passengers and 586 crew. There were lots of children onboard. The fire started at 3:30 in the afternoon, but the organisation of the crew was excellent, totally efficient. It was also a great test of the solidity of the ship's American construction. 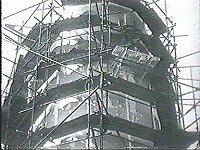 Photos above are of the workers repairing the ship after the fire. The fire spread upwards from the galley through seven decks. Even the dance floor in the ballroom buckled. The blaze continued for nine and a half hours, from 3:30 that afternoon until 1 in the morning. All passengers had to remain at their lifeboat stations. It might have been a major disaster. Kaparis finally reached the ship at Suva in Fiji, he immediately made a six hour examination of the damage. "I went to the galley and stood in water and mud up to my chest", he added. "After seeing the damage for myself, I phoned Mr. Chandris and told him that I can repair the ship in the port of Fiji, provided all passengers and 80% of the crew were disembarked for twelve days, and I felt confident that I could prepare the ship again to sail in twelve days. I sent for 110 workers from the Britanis and the Atlantis project in Greece and arranged for my office to be in the staff captain's cabin. I ordered new steel and cable, Four chartered planes delivered all sorts of parts. Parts were even sent from the Amerikanis in the Caribbean in two containers. It was an extraordinary effort that took twelve days to complete. We also used 350 Fijian workers as cleaners. We even had Fijian telephonists onboard. It was, of course, all big local news. In all, we spent £500,000. Amazingly, it was completed on time. The Australis sailed just six hours late on the twelfth day! In all, the experience reinforced my admiration for US-built ships" The Australis, ex-America had had a nasty fright, but once more she had been rescued by one of her most dedicated admirers. Read the Fijian newspaper article about the fire. However, the Australian run was finally hit, if far later than most other liner trades, by the invasion of the jets. In November 1977, the Australis made the last Chandris sailing from Southampton to Sydney and then went to a rather remote anchorage at Timaru in New Zealand. Rumours were that she could soon go to the ever-hungry Taiwanese scrappers. She had sailed around the world some 62 times, carrying over 300,000 people between 1965 and 1978. On May 18th. 1978, she was sold to Venture Cruises of New York for six and a half million dollars, quite a good deal, more or less the same price Chandris had paid for her some thirteen years earlier. (see the history part two section for more details on this episode). After bad press reports for the "Cruises to nowhere" out of North America, she was seized by loca Marshals and soon afterwards her owners closed their offices and vanished. The then renamed "America" sat out the summer moored at the old pier 92, the former Cunard Line terminal at the foot of West 52nd. Street in Manhattan. In late August, she was sold at auction. The buyers were Chandris, who had sold her in May for $5 million and now repurchased her for a mere $1 million dollars. Supposedly, Chandris' representative Mr. Kaparis barely outbid the Taiwanese scrap merchants. 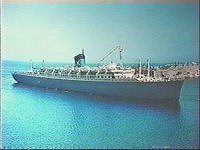 The America went back to Greece, was partially restored (and lost her forward `dummy' funnel in the process) and then reappeared, in April 1979, as the Chandris Lines' Italis. She ran two-week Mediterranean cruises from Genoa and Barcelona. But, she was out of work once again by the end of the year. In view of her age and high use of fuel, she simply became too expensive. She went back to Perama Bay and was laid-up. 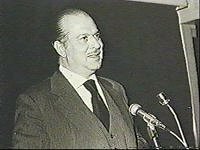 Demitri Kaparis' story was told by Bill Miller and is taken from his book: "The Chandris Liners"
The story above is mostly the view of Mr. Demitri Kaparis, the Chandris Lines Tachnical Director. I am indebted to Bill Miller for giving me permission to use some of his personal photos and information.